It knows that it must outrun the fastest lion or it will be killed. It knows that it must out run the slowest gazelle or it will starve. It does not matter whether you are a lion or gazelle. When the sun comes up you had better be running. Eulogies and the expression of loss. I was reading about the death of Boyd Clarke, and as I read, I was reminded of a time in my life when I had to eulogize someone. The experience left me wanting. I wanted words to carry my memories of a cherished grin, the rumble of a laugh, and the warmth of a hug. Reflecting back, the eulogy I gave could have been to an empty room. The words I spoke were for me, to fill a hole gaping and raw, left by a loss of someone loved and admired. So I feel for those who are moved to eulogize someone. The words we use are so one dimensional and inadequate, when trying impart a grin, a laugh and the warmth of a hug. A question for the ages, or not. WHY do people back into parking spots?????? From my unscientific survey, people take longer backing in than pulling in forward. Do these people need to feel as if they are ready for a quick get away? All I know is it drives me crazy waiting for these nut jobs, as they take up the whole lane to get a good angle. Then waiting as they make at least one pull forward to adjust their initial crappy park job. If you are one of those backward parkers, PLEASE just park like everyone else. I can understand if your robbing the Walgreens but otherwise give me a break. Find the best vantage point to watch fireworks from. Plan walking excursions when in strange cities. Look for Randy Rhoades grave. Finding cool locations for a house or places with a great view. Find short cuts home from work. Penetrate the layers of privacy the idle rich use to hide there homes. Look at water ways in farm land to avoid buying a swamp. Show friends where your hotel was located in Paris. Find the places the government doesn’t want you to see. See what the cold war gave us. I have been quite lazy in maintaining my blog so I though a change in theme might motivate me. I found the Connections theme on Alex King’s Theme page. Connections was the winner of the WordPress 1.5 theme contest. I have always been facinated with tunnels and I guess that’s what drew me to this theme. Just a few pointers that make eBay auctions look more attractive. Include a picture of the actual item. Nothing bothers me more than people who show the marketing image. Let me see what I’m buying. Provide detailed informtion in the description. I hate to have to ask basic questions. Use a Standard freight calculator. I hate being soaked by over priced shipping and HANDLING charges. 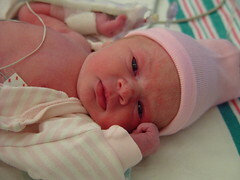 Kaitlyn Loretta Carroll is the newest member of the Carroll family. She has sandy brown hair and a wonderful smile.